The biggest addition in the recent updates is the new Import/Export functionality. Initially implemented in v.4.2.5, the new Import/Export functionality is both a revamp of the previous “Import clients via CSV” feature, as well as an implementation of a popular request. As of WP-Client v4.2.5, you can now export existing clients (and staff) from your installation into a custom CSV file. This CSV file can be used for backing up your client database offline, or for migrating clients from one installation to another, or for many other uses. 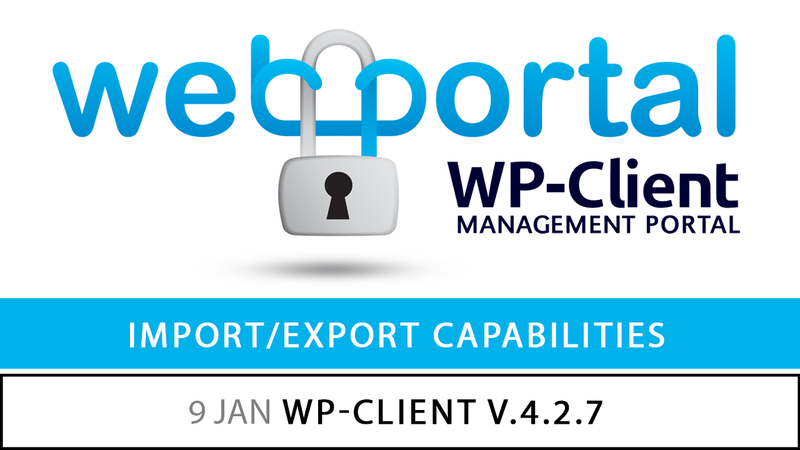 The functionality (which can be accessed using the “Import/Export” button at WP-Client–>Members–>Clients) will walk you through the process of deciding what data you want to export (including what users, what fields, etc), using an easy-to-follow wizard format with drag-n-drop functionality. The end result will be a CSV file that you can download and utilize as desired. The same Import/Export wizard can be followed in reverse to import clients into your installation, using a CSV file formatted similarly to what was previously required to import clients into WP-Client. Another useful addition in the latest round of updates is the new Easy Mode option. Accessible from your settings at WP-Client–>Settings–>General, enabling Easy Mode will essentially disable/hide various parts of the plugin that are not part of the “core” functionality. This includes functionality such as Circles, Client’s Staff, Custom Redirects, and more. With Easy Mode active, the plugin is pared down to it’s core elements, which may be useful for those of you who do not wish to utilize all that the default WP-Client has to offer, and are possibly overwhelmed by the sheer amount of options and settings available to you. Easy Mode can be enabled or disabled at any time from your settings, so you are free to try it out temporarily to see if it fits your needs. A smaller change that is still worth noting is that the WP-Client Custom Navigation settings have changed locations, and also expanded a bit. As of v4.2.2, you can control your Custom Menu assignments from your main WordPress–>Appearance–>Menus–>Manage Locations settings. At the same time, we also implemented a new functionality that gives you the option to assign Custom Menus to specific Circles if desired. Additionally, this round of releases also includes some bug fixes related to the Files Table shortcode, using SendGrid to send email notifications, errors related to installations running older PHP versions, as well as some small improvements related to various assignment popup boxes in the backend. A few other minor bugs have also been addressed, in addition to the normal streamlining and text updates.